Male’kith, the Witch King, the so-called new Phoenix King, the apparent Chosen of Asuryan. The beast is, was, a servant of Finubar. The true Phoenix. There. On the left. One on its own. A slash in the night and it’s done. One less prey. This is where the beast feels truly alive. On the hunt. Stealth, shadow, slice, stalk, bite. More dead. Triumph. The few remaining elves in the trees stop, as a howl pierces the night, its savagery chilling even the once-denizens of Naggaroth. Gathering up their weapons, they regroup, forming a tight circle, praying, hoping that they survive the night in the Wolf’s forest. Fear. They reek of it. Pitiful creatures. Not worth the hunt. Tensing muscles, unleashed strength. Savagery, rending claws, wrathful bites. In moments, only one prey remains. Summoning of magic. An amber streak pounces onto the elf next to Kal’un, of Har Ganeth, the elf’s body broken before it hits the ground. Two more of his squad have been killed before the streak becomes recognizable as a giant wolf, walking upright, claws gouging through armour as if it were parchment. “No. Male’kith is not my King, that was Finubar. Go back to your master, and tell him he will never have Moonsinger loyalty.” As the Elf lord turns to leave, the Executioner launches forward, his blade sweeping in a decapitating strike. A strike that never lands. With a flash of light and a small incantation, the Mage-Prince of Saphery summons forth one of the principle offensive spells of his chosen lore, an Amber Spear that penetrates the chest of the Druchii pinning him to the forest behind him. Summoning the Wind of the Beast to him once more, Karalael performs the cantrips that send messengers to his allies, and his retainers, informing them of the attack on him and his plans for the future before allowing himself to become the beast once more. Last edited by Karalael Moonsinger on Thu Jan 01, 2015 9:31 pm, edited 1 time in total. Pacing the polished floors of his Great Hall, Karalael silently fumed, before turning to the assembled group of his seven closest advisors. “How?! How could the Witch King be the ‘Chosen of Asuryan’? Are we supposed to just forget the atrocities he, and his dark kind, have inflicted upon our island? Well, I can not. His machinations have taken too many people we loved. Faecine, Tanith as well as countless of our forebears. No, we cannot join with Malek’Kith. So what options does that leave?” He looked around at the group, hoping one of them could help provide a solution. The aging Loremaster and the Wolf’s Guardian looked at each other before sadly shaking their heads, as elves of the White Tower they still hadn’t recovered from the High Loremaster siding with the Witch. “Why not go-“ “-to Elthin-Arvin and form a colony? We would still fight-“ “-the Great Enemy, just not with the Druchii.” Karalael’s granddaughters Faere and Taelia, the pair know as the Twin Wolves, asked. “Aye, my Lord, we could use the Sea-Wolf. But it would take time to prepare and load any that wish to come with us.” added Faeith, the captain of Karalael’s Hawkship. The three elves quickly nod and rush out of the Great Hall to set to their appointed task. When just the three Mages were left, Karalae’s age seemed to catch up with him, his shoulders slumped and his eyes grew weary. Is this really how the Asur fade? Not through the clash and intensity of martial lives but through the will of a fickle deity? One who would put his children through such torment? Were all those deaths, the familys affected really necessary? If they were, perhaps it is good we move to a new home. Now all I need to do is work out where to get some spare ships. Anyone got any they have spare? Great story telling. Thanks for posting. “Captain, how do the Sea-Wolf’s preparations fare?” The call came clearly across the frantic midday activity of the river wharf. “Well done, you’ve exceeded my expectations. Carry on.” As Karalael turned to leave the wharf, a disturbance and cries from the crowd drew his attention. Moving to investigate the cause, he comes face to face with a scar-covered elf wearing the sombre muted tones of the Wolf Packs, the Nagarathi trained scouts of Tor Lupa. “Kurnous’ teeth!” Karalael swore, “Faeith, tell your men to start getting the townsfolk aboard the fleet. Saeril, go back to the Wolf Packs and tell Caeril to fall back to the city, harassing the foe as much as he can. We need time to ensure our people are safe.” As his two companions hurried to complete their appointed tasks, Karalael gathered up a small amount of his power and with a gesture sent messenger animals to prepare Tor Lupa for war. “Keep your marines, Captain. Keeping our people safe is more important. Now to the battle. We need to hold the walls, at any cost. Liya, you shall be in charge of our archers including the Twins’ Guard, the Hunters and the Wardens of Moon Keep as well as our Eagle Claws. Target any monstrous creatures first, Hydras, Phoenixes and the like. Aeric, I want you to command our cavalry. I feel your proficiency with the winds of Qhaysh and Ulgu will protect them best as you make strikes at their flanks and bolt throwers. I shall also be putting Caeril and his Wolf Packs at your disposal as well. Faeritael, you shall be commanding the infantry. You shall also have Anaris who will be carrying the Banner of Tor Lupa. Your forces shall be where the foe shall strike hardest, but you shall prevail. Giliad and Alya, you shall take the Starblades and the Amber Wolves and stay behind the walls. You will act as a reserve force, shoring up where our lines look weakest, using your magics to aid the wounded, as well as defending any breaches. You may well be our last line of defense. I’m counting on you, we all are. As his family and retainers moved to their positions, Karalael and his granddaughters moved to their waiting mounts, the griffon Moonclaw and the great eagle Titania taking wing as soon as their masters were ready. The Amber Wolf surveyed the two battle-lines one final time, before signaling his forces to begin the fight for Tor Lupa’s freedom. As a side note, I'm really enjoying writing the Twins speech. I just hope I'm getting the fact they finish each others sentences across properly. The next few updates will be a bit odd. They may well be a bit shorter than usual but they will all form Chapter Three, concentrating on the elves in charge of the various sections of Tor Lupa's army as detailed in Chapter Two (Faeritael, Aeric, Giliad, Liya and Karalael). So without further ado, here is Faeritael's part. Trepidation and a kind of hollow sickness surrounded the ranks of the citizen-levy of Tor Lupa. Today was no glorious battle to defend against the fell creatures of the forests or the mountains. Nor was it a day that would be sang about as a tale of heroism to be held up as an example to little elflings. No, this day they would fight allies from other kingdoms, friends they had known from their youth gone to side with the Witch. Faeritael understood the concerns of the elves under his command and sympathised with them. Already he had spied familiar and once friendly sigils across the field beyond the great marble walls. It was almost enough to make him despair, and it would have been enough were it for the hundreds of elves now boarding the ships at the river behind him. Looking around at the faltering elves surrounding him, he exhaled before moving to address them. "Fellow warriors of Tor Lupa! I see in your eyes the same doubts that plague me, that you are concerned about fighting our own kin. Well, let us all put those doubts to rest! They chose to follow the Witch King. They chose to ally with the Druchii. They come here to force our obedience! The mailed fist is not the way of the Asur. The way of the Asur is protect against and to fight the darkness, which is why we shall stand firm. The light of free Asur gets brighter the longer we give the civilians to get to the ships, which is why we shall stand firm. We have, for time immemorial, stood as the protectors of this land and we do so again this day, which is why we. Shall. Stand. Firm!" He looked about himself again, amidst the cheering he saw steely resolve shining back at him like thousand of blazing stars. 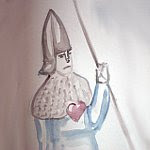 As he took his spear from a waiting squire, the signal came from his father for the battle to begin. From the flanks and overhead came the whistle of countless arrows loosed in volley after volley, interspersed with the staccato twangs of eagle claw batteries and the sizzling caused by the enchanted bows of Avelorn the Hunters carried. Into this blizzard of steel and fire charged vanguard of the Phoenix, with each felled Reaver Knight or Silver Helm a cause for tears and each Dark Rider laid low a cause for cheers. But the hail of arrows and bolts was not enough to hold back the tide and soon the enemy were at the walls with ladders being raised; the spined, black iron cruelty of the Druchii contrasting with the elegant whitewood of the Asur. Faeritael thrust his Avelorn spear deep into the breast of the first attacker that made it to the parapet before him, the forest-blessed steel carving through the ithilmar as if it were air, before slamming his shield into the next, sending the unfortunate elf hurtling to the ground. His perception narrowed to the space surrounding him, the relentless barrage of enemy attacks, the countless parries and ripostes and spear thrusts. As he cut down yet another warrior of Ulthuan, he suddenly found himself without an opponent and, casting his gaze across the battlements, he saw that his elves had repelled the assault for now. As the Huntmistress of Tor Lupa raced to her command, her natural elfin grace honed and improved by years scouting the wilds of the Avelornian forests and the crags of the Anulii served her well in avoiding the rush of defenders that always comes in the calm before a siege. She had been given an almighty task by her liege, it had fallen to her to ensure the most effective placing of archers and bolt throwers. She would not let him down. Her forces were ready when the signal came, archers high and bolt throwers higher still to increase their killing range. Her Hunters, daughters of Tor Lupa trained in woodcraft and given gifts of enchanted bows, were placed above the gatehouse with Liya herself. With a sweep of her arm the archers of Tor Lupa let loose, each release of a bowstring claiming the life of an enemy of the Wolf. As the forces of the Phoenix closed with the walls, another signal from Liya subtly changed the way shots were taken. The archers' shots, though still rapid, were more focused, targeting those of rank or with banners. The Bolt Throwers targeted the many chariots or Ellyrion, Chrace and Naggaroth design as well as those from Eataine. And the Hunters. The Hunters did what they do best; they targeted the monsters, foul Hydras and noble Phoenixes, that Malekith had sent to their walls. As the lines clashed, the Hunters found themselves under attack as Cothiqii mariners and Druchii Corsairs assaulted the gatehouse, sea javelins and repeater handbow bolts flying towards the. As she-elves all about Liya fell from the missiles, the survivors of the barrage grimly drew the blades strapped to their backs, Liya herself drew a Chracian hatchet from a loop on her belt, before leaping into the fray. The skill forged on countless twisted creatures served the Hunters well initially, Corsair and Cothiqii falling like wheat during the harvest. But as the numbers of the invaders began to tell, the Hunters started to fall to cutlass, spear, net and knife until Liya and a mere handful of her warriors were left. As the shadow of the Pale Queen loomed over them, those left stared at the enemies before them, hatred radiating from them tangibly, before gripping blood slicked hilts and lifting weary arms to give battle once more. Two Hunters died before they were able to strike, the remainder felling a number equal to their own. Liya was the last to fall, a cutlass' parry stealing her strength, a shield to the chest stealing her breath and, finally, a spear's thrust stealing her life. Last edited by Karalael Moonsinger on Sun Jan 04, 2015 10:18 pm, edited 1 time in total. It is sad indeed. So many dead. Fingers crossed the defence is not in vain. @Aicanor, thanks for commenting. This is an odd thing to write, so many of these deaths are models I've invested time and effort into. It's a bit heart-wrenching. I'm not sure how people do it. Closer the Assassin crept to the unsuspecting Princeling, the grim runes along his blade dimly pulsing with a dark hunger. As he got close enough to strike, the Druchii leapt forward as though a coiled viper, poisoned fang flashing through the air. But before the blow could strike, the elf found himself surrounded by a whirling wolf, it's singular amber eye promising death and swift retribution. Bewildered and bedazzled by the icon before him, the Assassin did not notice the glittering Chracian battleaxe that appeared before him, nor the hulking elf it belonged to. Wielding the large weapon in one hand as if it were made of cloud-wisp and clad in ornate heavy armour and a dark grey, almost black, wolfskin of the Amber Wolves' Captain, the Asur lashed out again and again. Thunderous blow after thunderous blow rained down upon the desperate Druchii's defenses, before Anaris finally brought his axe down, cleaving into the dark elf's ribs. "My Lord, are you unharmed?" Anaris asked as he pulled his axe free and caught his breath. Shaken at how close he'd been to death, Faeritael nodded at the bearer of the Banner of Tor Lupa, "I am, thanks to your swift intervention. I had thought all the Khainites would have joined with Tyrion, why is one here?" "I know not, my Lord", he falters, eyes drawn toward the Army of the Dark Phoenix by a stirring and the sound of drums, and not just any drums. The drums of the Guard, both Phoenix and Black. And above them, a pair of dragon riders! "However may I suggest we solve this riddle another time, as I fear we may soon be too taxed for such thinking." Faeritael nodded and turned to muster the infantry he led. As he did so Anaris, seeing more time was needed, planted the banner he carried into the battlements, marble splitting beneath his force and the silversteel spike of the banner's base. Stepping in front of it, he took his axe in the two handed grip taught in the Tower before roaring to the skies. One of the dragon riders, riding an emerald-green dragon reaching the end end of it's youth, recognised the roar as the challenge it was. They drew their sword, which burst into flame, in a quick salute before sending their mount swooping towards Anaris, marking the runes of a fire spell with their gauntlet. As they finished the incantation, the flaming runes coalesced into a fiery orb which engulfed the defiant Sapherian. As the fires dissipated, they revealed Anaris standing uninjured, wolfskin cloak charred, pitted and smoking. Offering a quick prayer to Kurnous, Anaris waited until the dragon was close enough to strike before making his move. Avoiding the first lunge of the dragon's teeth, his axe bit deep into the beast's neck allowing him to use it as a handhold to climb onto the Sun Dragon. In a shower of gore, he wrenched the axe free and heedless of the dizzying heights, raced toward its rider. The rider, clad in ornate armour of Caledorian design, vaulted to their, no this close Anaris could tell it was a her, feet. The two Asur advanced along the scales of the injured dragon, flaming sword and bright magic versus chracian steel and sapherian willpower. Suddenly the she-elf leapt forward, her sword weaving intricate patterns in the air whilst her fingers traced embers as she called upon her powers once more. Parrying the majority of her blows, he forced an opening and, recognising the potency of the fire magic he faced, sliced through the mage's casting arm causing the flaming runes to flicker into nothingness. The Caledorian's face paled as the axe fell, her sword, flames dying down, falling from shocked fingers. As she stared at the ruin where her hand used to be, her mount bucked and weaved, dipped and rose, feeling her pain through the empathic link all elves share with their mounts and trying to remove the cause of her distress, little realising neither elf above was secure. The she-elf was the first to fall, the screams stretching out for an eternity before abruptly being silenced. Anaris held on to the saddle straps grimly to avoid the same fate, but the Sun Dragon had other ideas. Reaching back with its serpentine neck, the dragon clamped its razor-sharp teeth into the elf's leg, the pain causing Anaris to release the straps and be held aloft by the dragon's jaw. Not being an elf to accept the inevitable, Anaris tried repeatedly to fell the beast before it stole the life from him. He struck frantically at the dragon's eyes trying to blind the beast - like he was taught - but to no avail, all he suceeded in doing was ravaging the dragon's snout and making his own wounds larger. At least that is what Anaris thought, unbeknownst to him, the blood from the wounds he inflicted was flowing into the dragon's eyes making it impossible for the beast to see. Meaning it didn't see the ornate marble tower it was hurtling towards. Anaris did, however, and redoubled his efforts to free himself, using his axe to attack the jaws of his captor. It was only a lucky strike cutting through the dragon's jaw tendons that finally freed him, slamming him through one of the stained windows of the tower, while the dragon crashed into the walls, bringing the top of the tower crashing down on both dragon and elf. Aeric Evenstar, Archmage of the Tower and Guardian of the Wolf, drew on his power and lay it about his companions as though it were a cloak. Speaking the words of power and the name of the Crone, he gestured and a portal to the hidden, phantom Ways opened before them. Gripping the reins of the destrier beneath him, Aeric urged the horse into the shadowrealm, looking back to ensure his warriors joined him. Scores of riders, in finely crafted armour and bearing the sigil of their Moonsinger lord, as well as elves in the colours of the Wolf Packs followed him through, faces grim as their trust in the wizard battled with their fear of those ancient pathways. "There are many temptations to found in this place." the Archmage began, as the final elf crossed the threshold into the fey tunnels, filled with witchfire and eerie sounds. "Many are the dangers of the Ways, least of all the folly of distraction. Do not leave the road, and those fates shall not befall you." As he finished his warning, Aeric led the elves under his command cautiously along the shadow path. Travelling amidst the evil cackles and twisted glares fraught the nerves of even the hardiest of the company. But through their will and under the unrelenting gaze of Aeric, not one elf fell foul of the ancient magics as they emerged in their world, in the vales of Tor Lupa, the rear lines of the Phoenix's forces before them. With swift, decisive motions, the mage drew aethyric runes in the air, weaving the spell that would be the signal to attack. The Household Guard, proud and disciplined riders, rapidly maneuvred into formation while the Wolf Packs blended into the terrain, targeting the vulnerable crew of the Eagle Claw batteries and the druchii war engines. Finally Aeric finished his runes and, barking out a secret name of Asuryan, signaled the assault. White flames engulfed bolt throwers and their crew, the smell of smoke and charred meat drifting across the field as well as the tortured screams of warping metal and cracks of scorched wood. Blue fletched arrows and the thundercrack of splintered lances silenced the shouts of the crews not afflicted by the firestorms. As the lances and arrows of his force felled the crew, Aeric sent the magic of Vaul to unmake the engines of war that were assailing Tor Lupa. With the bolt throwers neutralised, Aeric split his forces to harrass the Witch's flanks, sending Caeril and his Packs to attack the archers threatening the walls. He then led the remaining cavalry in a series of hit and run attacks, targeting those who had separated from the main battle line through the eddies and tides of battle, falling upon them with magic and steel. A cohort of spearelves were cut down by phantasmal blades, a corsair raiding party fell screaming through a vortex of shades, tiranoci and nagarrothi chariot timbers split under the blade of a spectral pendulum. Buoyed by the confidence of victory, Aeric led his elves into more daring and risky charges, choosing larger units that were closer to others. He led a charge into a regiment of Chracian woodsmen, repeating the runes of the firestorm that had destroyed the bolt throwers previously, but as he spoke the secret name, he felt the interference of another, causing the gathered power to surge beyond his control. As he tried to divert the excess, he saw the white flames devouring the regiment of the Chracians, before he was forced to focus even more on controlling his magic. Shooting out in waves of multihued light, the magic exploded outwards, free of all control. Wherever it struck, rainbow explosions blossomed. The raw magic scythed through Chracian and Sapherian, Wolf and Phoenix alike. Thrown to the ground, Aeric saw the desolation caused and stalking through it, a scantily clad elf-witch, a mocking smirk on her lips and sacrificial dagger in her hand. She crouched before him, stroked his cheek before thrusting the blade through his heart. The streets near the walls were quiet and abandoned save for a small group, no more than fifty elves strong, led by an elf in lacquered armour. Next to the leader, who was sat cross-legged in a relaxed state, paced an elf maiden wearing robes in the fashion of the the White Tower. "Alya", began the seated elf, unfolding his legs and starting to rise, "I understand your restfulness, but you should conserve your energy. We may be called upon soon." As if to prove his words true, one of the others in the group, Sword Master of Hoeth, shouted and pointed towards one of the many side streets leading towards the river. "Esteemed Loremaster, I saw movement down towards the ships. They seemed to be scouts, similar to our Wolf Packs." Giliad spat out a curse, before motioning for a small group of the assembled Sword Masters and Amber Wolves to join him, "Alya, stay here and follow our orders, I shall investigate these scouts." Turning to the street indicated, he broke into a run in order to catch the interlopers before they disrupted the evacuations. As he raced through the streets of his adopted city, Giliad called upon the wind of life drawing the power of Ulthuan to rejuvenate his allies and give the strength of the World Dragon. Coming up to the docks, the elves heard the sounds of battles and the cries of the wounded. As they stepped out onto the wharf, they were greeted by the sight of Sea-Wolf marines defending skiffs and barges from a band of yvressi rangers and druchii Shades. Commanding the small group to defend the ships while the marines got the townsfolk onboard and cast off, the Loremaster focused on the raiders' leader, a hulking brute of an elf clad in the rough leather eye-patch, thigh-length sea boots and sea-drake cloak of a corsair, fixing him with a steely gaze, his usually storm-grey eyes tinged with purple as he drew upon the power of Shyish and the Pale Queen. Drawing his hand into a claw, Giliad gestured and sent his opponent's soul spiralling to the pit of Mirai. As the elite warriors of the Tower and the bodyguard of the Prince finished the last of the raiders, Giliad noted that most of the ships had been launched and were huddled together in the Inner Sea. Which was good, as Alya and tattered remainder of the elves left at the wall as well as more of the Phoenix Host had appeared, their numbers indicating a breach in the walls. The elves of the Phoenix King paused in their pursuit of the female Mage and her guards to notch arrows and load crossbows, taking aim at the fleeing wizard. Seeing the danger about to befall his comrade, Giliad hurriedly spoke a magic incantation and sent a fog to obscure the vision of the archers, and to swap positions with the female, using his swift reflexes and Tower-forged greatsword to deflect the few missiles to find their mark. As the enchanted fog dulled the senses of the asur and druchii before him, Giliad easily fended off his opponents' blows, giving his allies time to reach one of the remaining vessels waiting at the quays. When the fog's effects began to wear off, the weight of numbers began to tell, forcing Giliad to give ground. Even as his Sword Master brothers returned to give their aid, they were too few. Determined to protect the innocent townsfolk, echoes of Faeritael's speech came to him, " The light of free Asur gets brighter the longer we give the civilians to get to the ships, which is why we shall stand firm..." Giliad swore to himself that he would help contribute to that light, and that while he stood, no free elf would be brought under the rule of Malekith. An oath he and his warriors would hold til the end of their lives. Well, this was meant to be Karalael's perspective of Chapter Three as described above but it kinda got away from me. So I merged it and Chapter Four. So here it is. Watching the battle rage from the sky was almost to painful to bear for the Prince of Tor Lupa, seeing his subjects, friends and fellow elves fall beneath him. But he had to remain, for without the aerial support provided by his daughters and himself, and the wing-brothers of the eyrie, the dragons, pegasi and griffons of the Host before them would run amok behind his walls, causing untold chaos and disorder. There had already been two such assaults repulsed, the first led by a young and arrogant lordling of Eataine who failed to comprehend the Warden who guarded the border from the depradations of Anulii-tainted creatures and spirit creatures from the dark corners of Avelorn would be skilled beyond his years. The second led by a more reserved yvressi, bearing the ancient arms and armour of a Paladin of Mathlann, his sea drake mount being defeated by the swiftness of Moonclaw, and the protection of Mathlann being defeated by savagery of Kurnous. Now a new assailant was coming, a rider in archaic naggarothi armour atop a Black Dragon, noxious fumes trailing in it's wake. Raising his lance in a salute, the Dreadlord didn't wait for Karalael's response before instructing his mount forward to clash with Karalael's griffon. Shearing the lance haft as it was plunged towards him, the Great Fang flashed in the setting sun. Sneering in disgust, the druchii threw away the ruined shaft and drew a sword, a slender, barbed thing designed to give a slow, painful death. As their mounts' momentum pulled them apart, the damage from that initial clash was clear. Both creatures were bleeding profusely from gashes caused by tooth, beak and claw. Hoping to save his faithful friend any more injury, Karalael put Moonclaw into steep dive hoping to put some distance between the two warriors and bring the dagon into the sights of the eagle claws. It was a good plan. The bolts of the batteries slammed home, penetrating deep. Wings shredded and heavily wounded, the dragon crashed into Moonclaw, the force of the impact wrenching the Great Fang from Karalael's grasp and causing Prince, Dreadlord, Dragon and Griffon tumbling from the sky. Only their preternatural reflexes saved Asur and Druchii from the fall, both springing from their saddles before they met the ground, rolling as they landed before rising, battered and bruised on the shattered remnants of the walls of Tor Lupa. Looking about him for a weapon, Karalael saw the Great Fang piercing the cracked stonework, crossing the haft of the Banner of Tor Lupa. Rushing to the artifacts of his house, he reclaimed his sword in time to deflect a blow that otherwise would have claimed his head. Fighting before the banner of his house, his city, his people gave strength to the Warden of Tor Lupa, his blade cleaving his foe's shield in two and forcing the dragon rider back step by step. Blades were striking faster than mortal eyes could see, parries and counter-blows happening more through instinct that any trained skill, both combatants covered in countless wounds. It was only as the Great Fang shattered the dark elf's vambrace and uncovered the face of Khaine the Poisoner that Karalael began to feel sluggish and dazed. Trying to fight through the haze of poison-numbed senses, Karalael struggled to defend himself under a renewed onslaught. In attempt to purge the venom coursing through him, he allowed his curse to overcome him transforming him into the immense amber-furred wolf that gave him his moniker. The Amber Wolf, still dizzy from the poisons, lashed out wildly. Claws, that if they had hit a bit higher would have ended the battle, sliced through dark plate and the pale flesh beneath. Hissing though pain-gritted teeth, the Dreadlord retreated slightly to catch his breath, but not for long, the Amber Wolf didn't allow him rest for long. Filled the unnatural endurance, beast pounced upon elf, it's power knocking the naggarothi off the battlements, it's savagery leaving his body a bloody ruin. It would have kept rending, were it not for an earth-shattering rumbling. Looking about itself, the beast saw the mountains of the east crumbling, the forests of the north and walls old when Men were crawling out of the mud falling as though Ulthuan herself were breaking apart. As the first cracks and chasms formed across the plains, the wolf glowed with an amber light transforming back to the proud Warden. With his witchsenses back, the Prince was disturbed by what he discovered. He could neither feel nor see the vortex anymore. Worse, he could feel the poison's icy grip approach his heart. As soldiers from both armies broke from combat and fled the field, those of the Phoenix feeling south to the safety of the Tower and those of the Wolf to the river and the awaiting ships, fear of this unknown quaking lending speed to their travels, a regiment of Malekith's Black Guard made to assault the disordered defenders of the walls and breaches amidst ever widening crevasses. Removing the Great Fang from his belt and the Shield of Tor Lupa from his arm, as well as retrieving the Banner from where Anaris left it, Karalael stopped a group of passing militia and pressing the artifacts into the leader's hands said, "Send the word to Faeritael, retreat to the ships. And give these to him." Turning away from them, picking up a pair longswords from one of the fallen, he set off to intercept the Black Guard. The first the Black Guard knew of Karalael's presence was the glowing amber spear penetrating rank after rank. The druchii left looked at the source of the attack, and saw the regal elf before them and despaired. A feral snarl twisted his face and his eyes glowed with a yellow gleam, fingers ended in claws and flesh sheathed in unyielding fur, another spear in his grasp and an immense flock of dark-feathered crows at his back. They saw the Mage-Prince of Tor Lupa with his full magical power upon him and nothing to lose. The first Guardsmen to attack the lone mage were mobbed by the servants of Corvus, each dying underneath a hail of black beaks. The next few fell beneath his second spear. Karalael didn't let the rest come to him, instead drawing the longswords and charging and mixing the fighting styles of the old, scarred nagarathi shadow-walker and bladelords of the Tower, blades striking at vital and debillitating locations, doing whatever he can to stop the elves before him. As the final druchii fell Karalael sank to his knees, the poison finally wrapping its chill fingers over his heart. As it overcame him, he looked up and saw his ancestors waiting to guide through the perils of the spirit, hands outstretched. Taking them, the Amber Wolf left this world. On the decks of the Sea-Wolf, Faeritael watched the elegant marble spires of his home buckle and collapse, tears flowing freely as he sailed towards the Inner Sea and the fleet of Tor Lupa. A gentle tap on his shoulder startled him, he turned to see who wanted him and stopped dead at the sight that greeted him. All about the deck, elves were bowing to him, the three closest to him offering items..
A banner. A shield. A sword. All bearing the mark of the Moonsinger family. All seen last in his father's possession. As the implications sank in and he took the items offered to him, the weather mage that had been sent with Giliad, Alya?, stepped forward, "My Lord, where do you wish to go? Shall we head to Lothern and the great gates or, or-" She stared with shock behind him, whatever she saw making her trail off to silence. Spinning to see what had caught the mage's attention, Faeritael was distraught by what lay before him. Ulthuan was crumbling, already half of his home was submerged. "No, set a course north. Lothern is the seat of Malekith and, if this is occuring Ulthuan over, the straits of Lothern will be overwhelmed. Head for Nagarythe, there may be passages appearing." Course decided, he took his daughters to the prow of his Hawkship to watch the destruction of Ulthuan and have a private moment of mourning for both Karalael and the magical splendour of Saphery, knowing the Old World would never see their like again. Well, heres hoping I can manage to do the epilogue by the deadline. Thats the end of tomorrow, right? And the end of Karalael's tale. Hopefully the Amber Wolf will be remembered by the remnants of his race. Faeritael, Faere, Taelia, Faeith and Alya deftly strode through the fallen branches and boughs of the newly inhabited Athel Sariour nar Ghur - the Vale of the Amber Moon in the human tongue - to the sacred, secret glade of remembrance. Dominating the clearing were baubles and tokens, each in memorial of family lost or left behind in the exodus from Ulthuan. The group had added several to the trees and rocks over the few weeks they had been in their new home; an ithilmar tower for Aeric and a starburst made of gems in all the colours of magic for Giliad from the twins, a bow and singular arrow wrought of finest sea-gold for Liya courtesy of her daughter Alya as well as a quartz star for Faeith's father, Faenriel. Today was to remember the Amber and Fire Wolves, Karalael and Faenice Moonsinger, the last Lord and Lady of Tor Lupa. Choosing the largest oak of the glade, Faenice's granddaughters walked forwards in perfect synchronisation. Reaching the tree, the girls placed a placed a phoenix crafted from a Cathayan fire ruby before stepping back heads bowed. As they returned to the group, Faeritael moved to take their place by the tree. As the token for Karalael, he hung a wolf head carved from amber taken from a bodi tree of Avelorn. Memorials placed, the group sadly took one last look at the tree before heading back to build their new life in Elthin-Arvan. Great end to a proud line of Asur. Thanks for sharing.